By Keyling T. Romero (Confidencial) – On her knees in a preventive holding cell at the infamous El Chipote interrogation jail, Yolanda Sanchez Moraga thought about her twelve-year-old daughter, while a guard threatened to cut off her hands and to give her over to some policemen to be raped. She cried with fear and in vain implored them to leave her in peace. Hours before, Yolanda and her sister Ana Patricia had gone to the march called “Together we’re a volcano”. 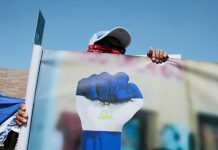 They took a pair of Nicaraguan flags and were dressed in its colors: blue and white. When the march concluded, some people offered to give them a ride to near where they lived, and both accepted. Nevertheless, when they were passing by the area around Station V of the National Police, a patrol began to pursue the pick-up truck they were in. That was July 12, 2018. “These dogs that are going around bothering the government must be killed,” they said to them, while both sisters and three other people were violently loaded into a mini-bus. A police official threw them in by their hair and hurled insults. Minutes later, they shot at the driver of the pick-up that had given them a ride, and Yolanda received some bullet fragments in her right leg. That’s why her leg was bleeding, as she remained on her knees being interrogated at the El Chipote jail. The six people who were arrested that day were presented to the court as criminals; two months later, all were found guilty and sentenced to six and eight years, respectively. However, a few weeks ago, the sisters were able to leave their prison cell for a change in their punishment regime, from jail to house arrest. “We left prison under conditions of family coexistence; that’s the name they gave it, but it turned out to be house arrest,” stated Ana Patricia, who affirmed that if the authorities had explained the new conditions fully when they were removed from the La Esperanza jail, she wouldn’t have left the prison. 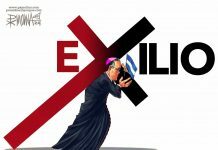 The day after dropping them at home, an official from the National Police arrived to confirm that the sisters were home and told them that they couldn’t go out, nor could they receive visits. 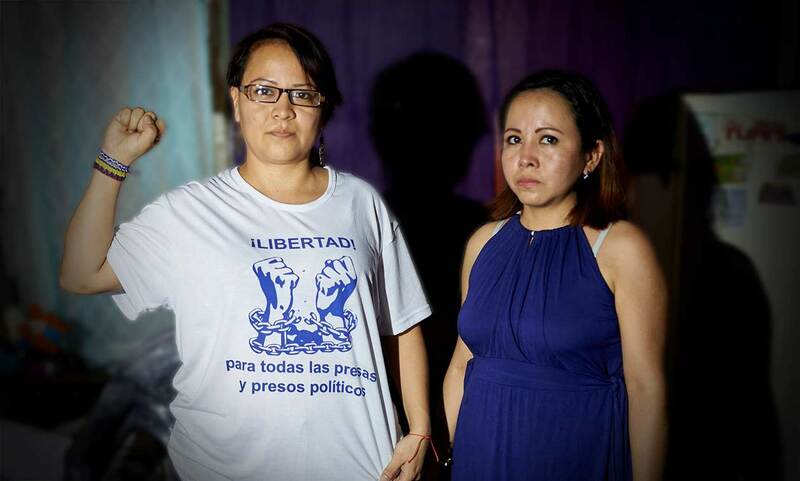 Yolanda and Ana Patricia were imprisoned for seven months. They were there with Nelly Roque, Irlanda Jerez, Amaya Coppens and other female prisoners. Since the moment of their arrest, their human rights were disrespected. They were isolated, and forbidden to approach the other female prisoners. Yolanda went several months without a doctor to examine the wounds on her leg. “They didn’t let us speak to anyone. They didn’t let us go out anywhere. They didn’t pass us the calls that are allowed the common prisoners. They had us watched in the cells through a woman who collaborates with them, according to what the other women told us,” declared Ana Patricia. Initially, they were locked in a cell well removed from the others, with a red ribbon on it that signified danger. They were forbidden to approach the edge of the window, and they were locked in behind a double gate and a double lock. Sometime later, the windows, which at first were only closed off by metal bars, had wire mesh installed across them, obstructing the ventilation. The treatment they experienced wasn’t as vicious as that of some of the other political prisoners who were leaders. Ana Patricia, for example, recalls the day that a group of guards tried to remove Irlanda Jerez, and the other prisoners opposed them and were beaten. “We weren’t in Irlanda’s cell, but we expressed our unity by yelling, telling them that we were going to denounce them, since a visit was coming soon. But they didn’t care and beat the women anyway. They didn’t beat us, but they did threaten us,” she recounted. 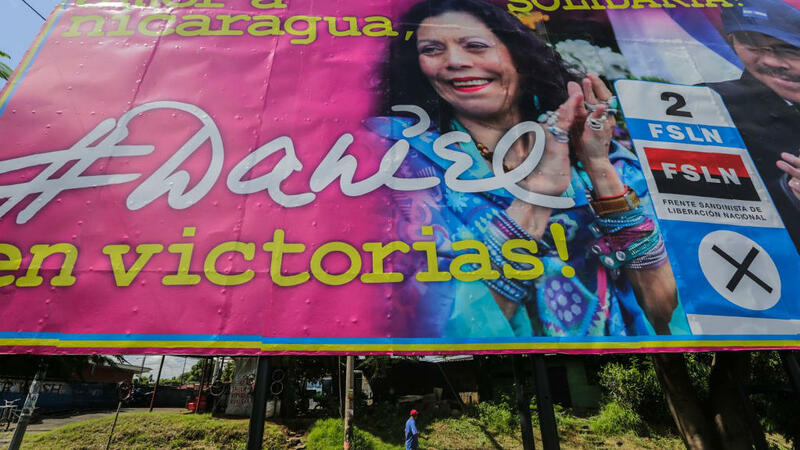 On September 18, 2018, Judge Wilfredo Ramirez of the Seventh Local Penal Court of Managua declared both of the Sanchez sisters guilty, as well as three other men who were also abducted the day of the “Together we’re a volcano” march. Both the sisters and Lenin Rojas, who was also given a ride that day, were sentenced to six years for the supposed crimes of illicit possession of explosives (mortars), illicit association to commit crimes, and illegal arms possession. Edwin Altamirano, owner of the pick-up truck, and Miguel Gonzalez were each given an eight-year prison sentence. In addition, they were fined 5,931.3 cordobas [approximately US $178] and the pick-up they were traveling in that day was seized. During the legal process, the judge ordered them to be freed since the charges against them were less serious, but the prison authorities never obeyed that order. “The only thing we did was to raise the blue and white flag, chorus some slogans, sing the national hymn and some protest songs. That was our crime,” the sisters said. The life of the two Sanchez sisters changed completely in April. They joined the protests because they weren’t in agreement with the way the regime was acting, and they participated in all of the demonstrations they could. Yolanda was left unemployed when the massive lay-offs began in some of the companies affected by the country’s economic crisis. “I felt the need to help in some way, even if just by shouting slogans at a march. If I could help in something, I did, because I didn’t agree with the way we were being treated,” Yolanda said. She also admitted that because of the psychological tortures she experienced, she has trouble sleeping. She often can’t get to sleep until two or three in the morning. “I sleep because I know that I have to try and rest. I don’t know why the nights are so hard. I’m afraid at night,” she stated in a trembling voice.